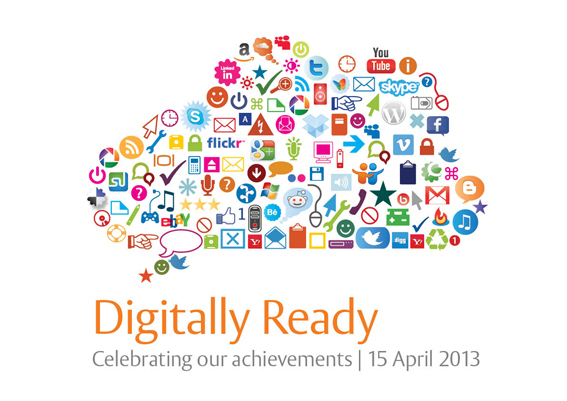 We still have a few places available for our showcase event ‘Digitally Ready: Celebrating our achievements’ which will take place next Monday, 15 April 11.00 am to 2.30 pm. 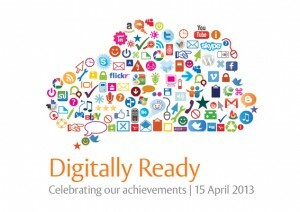 As the Digitally Ready project draws to a close, it’s time to celebrate our achievements – as individuals, as a community, as an institution. You may have come across some of our digital initiatives on the ground, but there are exciting developments on the strategic front too. University Vice-Chancellor Sir David Bell gives a view from top. With the current and expected growth of use of digital technologies in teaching and learning, it’s time to take a strategic view and approach as we move forwards. Gavin Brooks, Pro-Vice-Chancellor for Teaching & Learning Gavin Brooks gives an overview of immediate and strategic priorities that will enable us to meet and anticipate the digital needs of our staff and students. Conor O’Connor and Ashley Davidson, undergraduate students in Construction Management and Engineering, have developed Constructionchat.co.uk, a unique website that facilitates exchange of information between students looking to progress in the construction industry, and enables employers to get in touch with students. Most Higher Education institutions in the UK have devised social media strategies to target and attract new students. But to what extent are social media used in the delivery and assessment of teaching? Nikoletta-Theofania Siamagka, Lecturer in Marketing, has been involved in carrying out vital research to investigate the use of social media as a supporting tool for teaching marketing modules in the UK, and will present initial data gathered from 79 UK institutions. Technology plays a major role in contemporary installation, but art students may not have easy access to the kinds of technologies that can add a sensory dimension to their work and learning curves can be steep. Researcher Nic Hollinworth has been working with lecturer Kate Allen to introduce Art students at Reading to the potential of digitally-enhanced sculpture and installation. Students learn to design and develop artworks that respond to people or the environment through a series of experimental and exploratory hands-on workshops. Postgraduate researchers are central to our research mission. The Graduate School, the hub for all doctoral research activity across the University, is investing in developing its online training provision to further enhance the support and skills training that will help them fulfill their potential as developing researchers. Here at Reading we have been trialling enterprise social networking service Yammer since the start of the new year. Head of Web and New Media Helen Setchell is leading the experiment to find out whether ESP has the potential to help us improve communication and collaboration. Many students in Construction Management and Engineering have not practised maths since GCSE. Tim Lees, Teaching Fellow in Construction Management and Engineering, has developed a new blended learning approach to specifically support students in the development of the maths skills needed, including online quizzes, tutorials and podcasts to support traditional lectures and seminars. David Nutt, Lecturer in Physical Chemistry, has flipped two of his lecture courses, transforming them into workshops where concepts are put into practice, the students having prepared with the help of a video podcast beforehand. But how is he bedding down with this new approach to teaching? This event is open to all staff and students at Reading. Please book via Employee Self Service, or by emailing cstd@reading.ac.uk. This entry was posted in Assessment & Feedback, Digital community, Dissemination, Employability, Meetings & Events, Research, Small project funding scheme, Staff-student partnerships and tagged Ashley Davidson, Celebrating our achievements, Conor O'Connor, Construction Chat, David Nutt, Department of Art, Department of Chemistry, Digital Development Team, Emma Minns, Gavin Brooks, Graduate School, Helen Setchell, Henley Business School, Nadja Guggi, Nic Hollinworth, Nikoletta-Theofania Siamagka, School of Construction Management and Engineering, School of Systems Engineering, Sir David Bell KCB, Tim Lees. Bookmark the permalink.